Epicenter far away from the islands. Hypocenter in the deep hot solid mantle of the earth. Weak shallow earthquake near the village of Klos. To weak to create damage. Epicenter in the same area than another similar earthquake a few days ago. Same harmless depth. A very populated area. But even if a stronger earthquake would occur in this area again, the depth will neutralize the impact of the earthquake. Approx. 50 km out of the coast of Kencong. At this magnitude it will have been hardly felt on the island. Epicenter close to the Arctic Ocean (Northern part of Alaska) in an area where earthquakes are not that common. Epicenter on the upper part of the canning river. Except for some oil field at the coast, this area is mainly “polar bear country”. Epicenter closes to Antarctica than to Australia? In the middle of the Ocean. At a mantle depth of 621 km only animals will have felt this earthquake. Close to Balavu island. Epicenter on top of a subduction zone in the Sea of Ochotsk. Kuril islands are the island chain connecting Japan with Russia. Epicenter closes to Anatrctica than to Australia? In the middle of the Ocean. 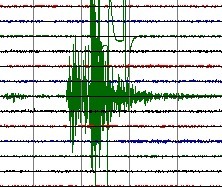 Shallow but very weak earthquake in the desert. Weak earthquake near the Caspian Sea. Average depth. Epicenter near the villages of Darmadar and Darmarakh. Too depp to cause any problems. Aftershock of the Mentawai earthquake, but this time more to the North West in between Sipora and Pulau Siberut, closer to Padang. Deep and harmless earthquake 30 km out of the coast of Mindanao. Epicenter in to sea about 40 km from the coast and on top of the subduction zone. Epicenter quiet deep and epicenter near the Torres Islands. Epicenter 50 km out of the Java coast. Harmless because of the magnitude and depth. Moderate harmless earthquake on the slopes of the subduction zone at the western tip of Java, but far out in the sea. Moderate harmless aftershock from the massive Mentawai tsunami earthquake, this time quite close to the South Pagai coastline. Since the M 5.1 earthquake from yesterday, numerous shocks are following each other. After this earthquake, 7 consecutive shocks varying from 4.2 until 4.7 in a period of 5 hours. The closest populated point is Adak, but at these Magnitudes the series of earthquakes are certainly not damaging. We will keep you updated if heavier shocks will occur. Very powerful earthquake with epicenter about 30 km from the island of Pangai. The last couple of days multiple earthquakes occurred in the same area. Phivolcs director Renato Solidum Jr. said in an interview on local television that the earthquake was felt as a maximum III Mercalli on Burias Island. The epicenter was 35 km out of the coast in the Sibuyan Sea. There were NO reports of damage or injuries and the shock had NOT generated a local tsunami. Molucca Seaquake with epicenter at a safe distance from the nearest islands. This very powerful earthquake doesn’t look dangerous to earthquake-report.com as the distance to the closest shoreline seems to be at least 70 km. The underwater slopes near the epicenter seems to be moderate, thus the chance on even a local avalanche generated tsunami seems very limited to none. Epicenter about 5 km out in the sea of the shores of the Indonesian island Wetar. The tropical island of Wetar belongs to the Indonesian province of Maluku and is the largest island of the Barat Daya Islands (literally Southwest Islands). To the south, across the Wetar Strait, lies the island of Timor; at its closest it is 56 km away. Epicenter on top of the subduction zone west of the southern tip of Sumatra. Powerful but distant enough from the coast to be categorized as harmless. Shallow earthquake with epicenter only 35 km (20 miles) NNW of Canakkale, Turkey. Epicenter is luckily located in the sea, but near the shores. No report of casualties in the local press. We could find out that testimonies did mention that the shocks lasted about 8 seconds. We have downgraded our category alert to GREEN instead of red. Poeple ran scared out of their houses. They returned to their homes after staying some time in the streets. Deadly earthquake Just next to Kraljevo. Kraljevo is a city with a population of 65,142 inhabitants. Deep earthquake about 50 km from Erromango. Not dangerous. Epicenter at 91 km (57 miles) SE (140°) from Feyzabad, Afghanistan. Moderate depth. Harmless. Epicenter far away from Sakhalinsk peninsula and very deep in the mantle of the earth.